The beige E6 Omnidirectional Earset Mic, Highest Overload, with Detachable 1mm Cable and Microdot Connector for Sennheiser Wireless Transmitters from Countryman is a vocal microphone with an adjustable boom that weighs less than one-tenth ounce. It is a water- and wind-resistant microphone that can be used on either ear for capturing audio in houses of worship, theater, or outdoor vocal and speech applications. In addition, the E6 Earset features three omni caps (very bright +8 dB, bright +4 dB, and flat +0 dB) that deliver response characteristics for most other applications such as recording flute and violin. 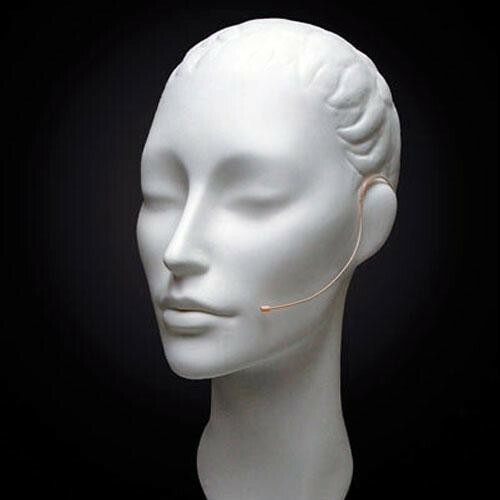 The E6 Earset is available as a directional microphone too with cardioid and hypercardioid caps. This omnidirectional E6 Earset's cable terminates to a Microdot connector for direct connection to a Sennheiser SK 2012 wireless bodypack transmitter.